Arctium lappa, commonly called greater burdock, gobō (牛蒡/ゴボウ), edible burdock, lappa, beggar's buttons, thorny burr, or happy major is a Eurasian species of plants in the Aster family, cultivated in gardens for its root used as a vegetable. It has become an invasive weed of high-nitrogen soils in North America, Australia, and other regions. 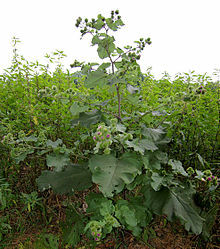 Greater burdock is a biennial plant, rather tall, reaching as much as 3 m (10 ft). It has large, alternating, cordiform leaves that have a long petiole and are pubescent on the underside. The flowers are purple and grouped in globular capitula, united in clusters. They appear in mid-summer, from July to September. The capitula are surrounded by an involucre made out of many bracts, each curving to form a hook, allowing the mature fruits to be carried long distances on the fur of animals. The fruits are achenes; they are long, compressed, with short pappus hairs. These are a potential hazard for humans, horses, and dogs. The minute, sharply-pointed, bristly pappus hairs easily detach from the top of the achenes and are carried by the slightest breeze – attaching to skin, mucous membranes, and eyes where they can cause severe dermal irritation, possible respiratory manifestations, and ophthalmia. The fleshy tap-root can grow up to 1 m (3 ft 3 in) deep. It is naturalized almost everywhere and is usually found in disturbed areas, especially in soil rich in nitrogen. It is commonly cultivated in Japan where it gives its name to a particular construction technique, burdock piling. The leaves of greater burdock provide food for the caterpillars of some Lepidoptera, such as the thistle ermine (Myelois circumvoluta). Greater burdock root is known as niúbàng (牛蒡) in Chinese, which was borrowed into Japanese as gobō and Korean as ueong (우엉), and is widely eaten in the region. It was used in Europe during the Middle Ages as a vegetable, but now it is rarely used except in Italy, Brazil and Portugal, where it is known as bardana or "garduna". Plants are cultivated for their slender roots, which can grow about 1 meter long and 2 cm across. The root was traditionally used in Britain as a flavouring in the herbal drink dandelion and burdock, which is still commercially produced. Immature flower stalks may also be harvested in late spring, before flowers appear. The taste resembles that of artichoke, a burdock relative. In the second half of the 20th century, burdock achieved international recognition for its culinary use due to the increasing popularity of the macrobiotic diet, which advocates its consumption. The root contains a fair amount of dietary fiber (GDF, 6g per 100g), calcium, potassium, amino acids, and is low calorie. It contains polyphenols that causes darkened surface and muddy harshness by formation of tannin-iron complexes. Those polyphenols are caffeoylquinic acid derivatives. A popular Japanese dish is kinpira gobō, julienned or shredded burdock root and carrot, braised with soy sauce, sugar, mirin and/or sake, and sesame oil. Another is burdock makizushi, rolled sushi filled with pickled burdock root; the burdock root is often artificially colored orange to resemble a carrot. Burdock root can also be found as a fried snack food similar in taste and texture to potato chips and is occasionally used as an ingredient in tempura dishes. Fermentation of the root by Aspergillus oryzae is also used for making miso and rice wine in Japanese cuisine. Burdock roots contain mucilage, sulfurous acetylene compounds, polyacetylenes and bitter guaianolide-type constituents. Seeds contain arctigenin, arctiin, and butyrolactone lignans. Size of greater burdock leaves. The man holding the burdock leaf is 180 centimetres (5.9 ft) tall. This is a burdock leaf. Note the steps in the background for scale. ^ The Plant List Arctium lappa L.
^ a b c d "Arctium lappa". Germplasm Resources Information Network (GRIN). Agricultural Research Service (ARS), United States Department of Agriculture (USDA). Retrieved 2017-12-15. ^ Grieve, Maud (1971). A Modern Herbal: The Medicinal, Culinary, Cosmetic and Economic Properties, Cultivation and Folk-lore of Herbs, Grasses, Fungi, Shrubs, & Trees with All Their Modern Scientific Uses, Volume 1. p. 143. ISBN 9780486227986. 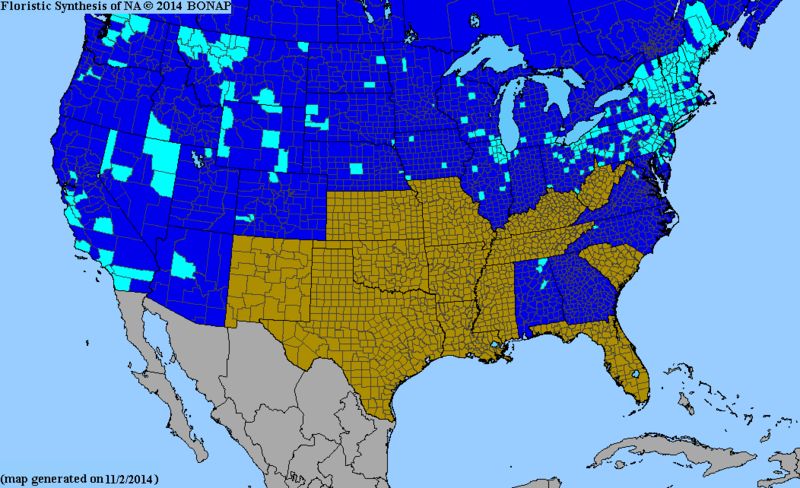 ^ Flora of North America Vol. 19, 20 and 21 Page 169 Great burdock, grande bardane, Arctium lappa Linnaeus, Sp. Pl. 2: 816. 1753. ^ Atlas of Living Australia, Arctium lappa L.
^ a b Flora of China Vol. 20-21 Page 153 牛蒡 niu bang Arctium lappa Linnaeus, Sp. Pl. 2: 816. 1753. ^ Cole T.C.H. ; Su S.; Hilger H.H. (2016). "Arctium lappa – Burdock pappus bristles can cause skin irritation and burdock ophthalmia". PeerJ Preprints. doi:10.7287/peerj.preprints.1871v1. ^ （井関 清経＝健康サイト編集）. "ゴボウの皮はむかないのが"新常識" (06/01/19) - ニュース - nikkei BPnet". Nikkeibp.co.jp. Archived from the original on 2012-09-04. Retrieved 2012-02-02. ^ Maruta, Yoshihiko; Kawabata, Jun; Niki, Ryoya (1995). "Antioxidative caffeoylquinic acid derivatives in the roots of burdock (Arctium lappa L.)". Journal of Agricultural and Food Chemistry. 43 (10): 2592. doi:10.1021/jf00058a007. ^ "New probiotic identified in fermented Japanese vegetable: Enzyme improves colon health in rats". Science Daily. ^ Chan Y.-S.; Cheng L.-N.; Wu J.-H.; Chan E.; Kwan Y.-W.; Lee S.M.-Y. ; Leung G.P.-H.; Yu P.H.-F.; Chan S.-W. (2010). "A review of the pharmacological effects of Arctium lappa (burdock)". Inflammopharmacology. ^ Zick S.M. ; Sen A.; Feng Y.; Green J.; Olatunde S.; Boon H. (2006). "Trial of essiac to ascertain its effect in women with breast cancer (TEA-BC)". Journal of Alternative and Complementary Medicine. 12 (10): 971–980. doi:10.1089/acm.2006.12.971. ^ Hayashi, K; Narutaki, K; Nagaoka, Y; Hayashi, T; Uesato, S (2010). "Therapeutic effect of arctiin and arctigenin in immunocompetent and immunocompromised mice infected with influenza". Biological and Pharmaceutical Bulletin. 33 (7): 1199–1205. doi:10.1248/bpb.33.1199. PMID 20606313. ^ Xie L.-H.; Ahn E.-M.; Akao T.; Abdel-Hafez A.A.-M.; Nakamura N.; Hattori M. (2003). "Transformation of arctiin to estrogenic and antiestrogenic substances by human intestinal bacteria". Chemical and Pharmaceutical Bulletin. 51 (4): 378–384. doi:10.1248/cpb.51.378. PMID 12672988. ^ Matsumoto T.; Hosono-Nishiyama K.; Yamada H. (2006). "Antiproliferative and apoptotic effects of from Arctium lappa on leukemic cells". Planta Medica. 72 (3): 276–278. doi:10.1055/s-2005-916174. PMID 16534737. This page was last edited on 27 January 2019, at 21:16 (UTC).